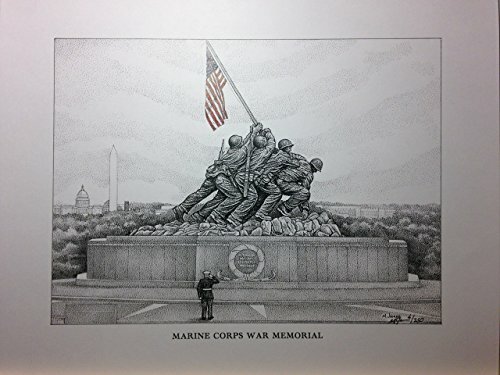 Limited Edition pen and ink print from hand-drawn original of the Marine Corps War Memorial adjacent to Arlington National Cemetery. It depicts the Marines raising the flag at Mount Siribachi during the Battle of Iwo Jima in World War II. Prints are from a series of only 250 prints and each is signed and numbered, with hand-colored flag. Your purchase includes print, foam-core backing, and about-the-artist flyer within an acid-free packaging. Print can also be purchased with 12"x16" size red mat, as shown in images.